The recap for episode 10 is finally here! After 109302930232 years. Yes I know it took me forever to recap this episode, but it’s better late than never right? Once again, I sort of rushed on this recap for this episode so please forgive me if it sounds crappy. There were some scenes I skipped out on as well so if there’s a time jump and you get confused, just go with the flow and continue reading. Haha. The episode starts out with Jin Yi meeting at a shop with her customers for her new business that she just started. If you recall from the last episode, Jin Yi designed a cute outfit for Barassi which a bunch of Kyung Mi’s friends really liked, so since then, they have been expressing their interest in the fabric and clothing that Jin Yi made for Barassi which in return is great for Jin Yi since she’s making money. Soo Kyung tries to get a company that takes cares of dogs to take care of Barassi over the Lunar New Year Holiday, but because the price costs $300, Soo Kyung has no choice but to reject the idea and spend her Lunar Holiday with her dog. 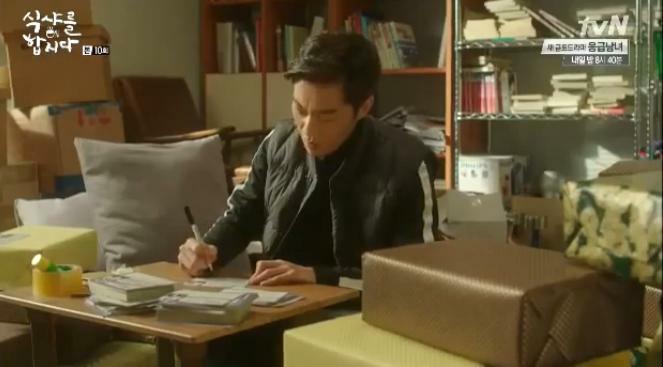 Meanwhile, in Dae Young’s apartment, he’s busy writing happy new year cards to all of his insurance clients and whines about how he has to write so many of them, but he encourages himself by saying that if he wants to become the Insurance King, he must endure the weight (could this be a possible pun to Heirs’s ‘He Who Wishes to Wear the Crown Must Endure its Weight? Haha). Episode 10 is called ‘Mr. 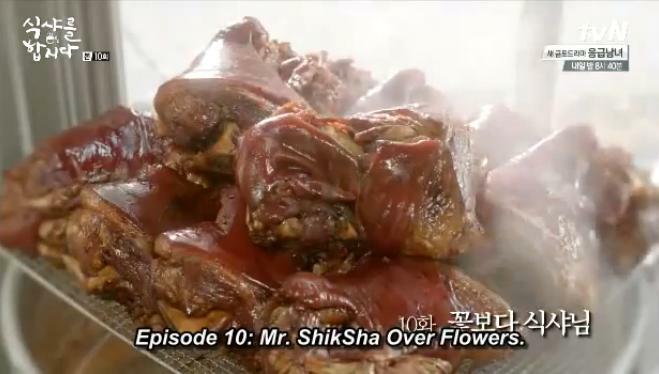 ShikSha Over Flowers.” Seriously though, what’s with all these references towards Lee Min Ho’s dramas? Or is it just me? Haha. Okay, maybe it’s just me being delusional and weird. Don’t mind me. Soo Kyung is at a job interview with a cosmestic surgery coordinator located at a surgery center since she’s unemployed at this moment. However, Soo Kyung still has her inner ‘Chief Secretary’-ness inside of her for she starts to suspicion the surgery coordinator for practicing medicine without a license and even begins to list the law that this illegal practice falls under. But the job interview goes badly and comes to an abrupt finish when the coordinator demands Soo Kyung to leave since she isn’t there for the right purpose. I don’t blame you Soo Kyung. Haha. Once outside, Soo Kyung’s stomach starts to growl so she ponders over what to eat. Dae Young is eating some very delicious food at a restaurant by himself when he hears a familiar voice not far away in the same restaurant as him. It turns out to be none other than Soo Kyung who is ordering a dish of the pig trotters with cold vegetables to go. Dae Young advises Soo Kyung to just eat with him in the restaurant since the food will get cold so she changes her mind and joins him. Soo Kyung discovers that Dae Young had come to eat by himself so she asks if he’s embarassed. But no, Dae Young is never embarassed (unless he gets complimented that he’s good-looking of course) and so to defend himself, he goes off on a rant and explanation about how eating alone is the “truth to eating.” Afterwards, the dish that Soo Kyung ordered arrives so they both dig in. When they’re finished eating, Soo Kyung stresses out over not being able to find a job which makes her sad and disappointed. Dae Young notices her behavior and tells her to cheer up because if she’s sad, he’s sad as well since he “owns” her. HAHAHA. 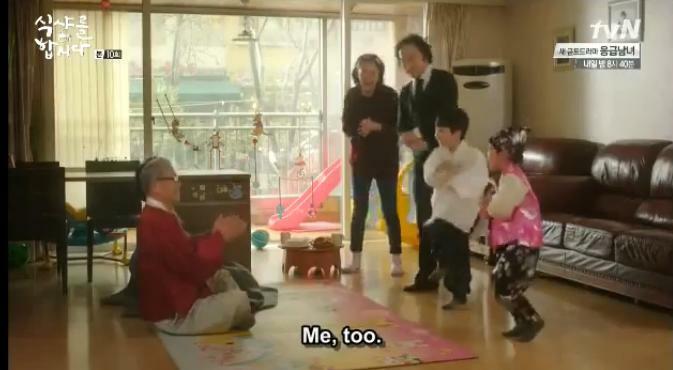 Gyu-sik is busy mopping the floor in the attorney office when he gets a call from Dae Young asking for Lawyer Oh. When he finds out that Lawyer Oh isn’t there, he enters the attorney office willingly since she isn’t there (how sad). Dae Young has come prepared with gifts to give to Lawyer Oh, Lawyer Kim, and Gyu-sik (awww, how nice!). Dae Young notices that the Chief Secretary desk is still empty so Gyu-sik explains that all the applicants that came to the interview had great qualifications and were good but Attorney Kim didn’t accept any of them. 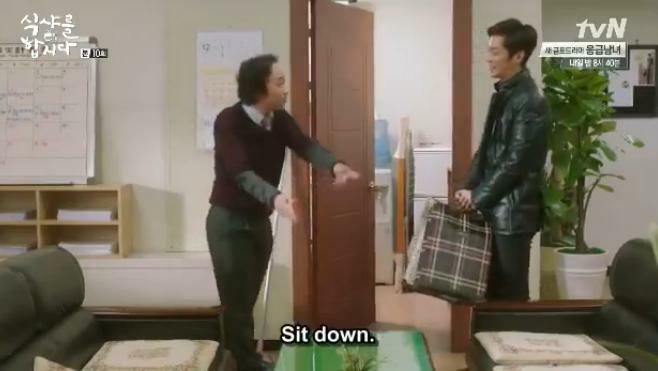 That’s when Dae Young updates Gyu-sik about Soo Kyung by lying that there are many places wanting to hire Soo Kyung these days (when really there aren’t). 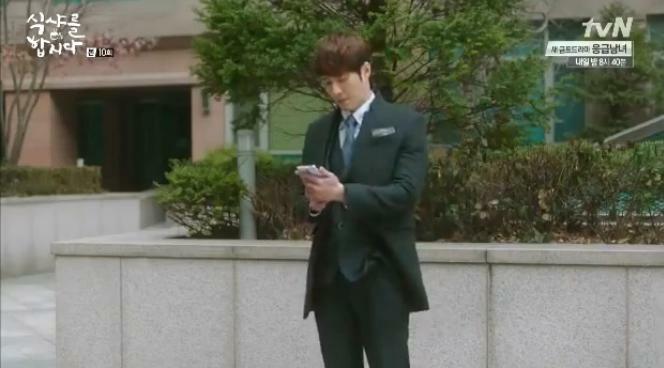 We see Lawyer Kim waiting outside of Soo Kyung’s apartment building, debating as to whether he should call her or not. But right when he does call her, he sees her exiting out of the apartment building with Barassi and runs up to her. Barassi starts barking at Lawyer Kim when he scolds her for not picking up her cell phone which causes him to jump back in fright. 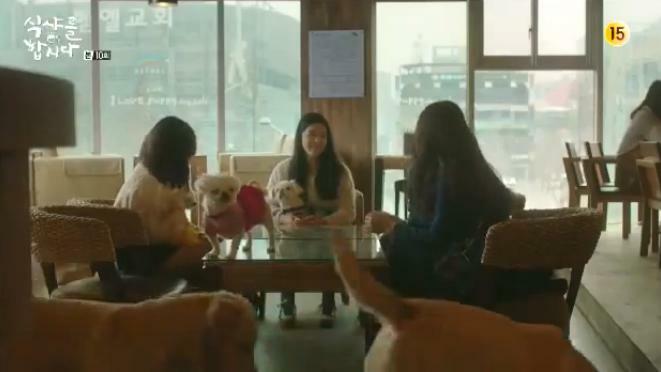 They decide to talk at a coffee shop but Soo Kyung has brought Barassi with her. Barassi doesn’t seem to really like Lawyer Kim (but I don’t blame him, haha). Lawyer Kim pleads for Soo Kyung to come back to work as Chief Secretary and so that this time will be better, he’ll give her a raise in her salary and will treat her better. Because the conditions have changed for the better, Soo Kyung is willing to return to the attorney office as Chief Secretary again. Just when she’s about to leave, Lawyer Kim holds her back by grabbing for her wrist, but just slightly misses so their hands touch. It’s an awkward moment between them so Lawyer Kim goes straight into asking Soo Kyung if she could return to work on that day since nothing’s been going right since she left. Back at the attorney office, Lawyer Oh opens her present that Dae Young gave her. 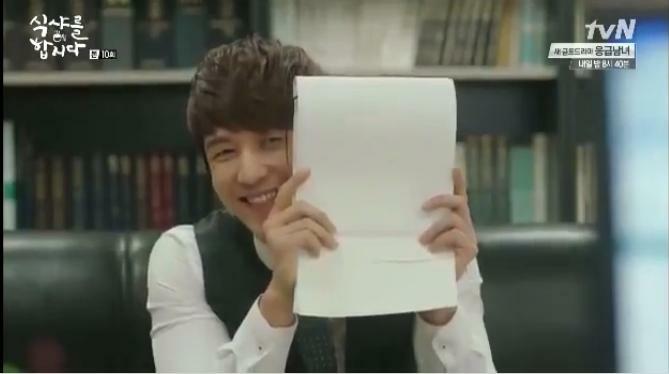 She finds an envelope (that apparently wasn’t given to Gyu-sik) and finds it to be a 1 day, 2 night certificate at a resort. Just when she’s going crazy spazzing over this certificate, she is alarmed at the sight of Soo Kyung and Lawyer Kim who explains that Soo Kyung will start working as Chief Secretary again. So everyone is happy and content. Jin Yi enters an elevator by herself when a suspicious man wearing a mask and dark green coat joins Jin Yi. She becomes suspicious and frightened of him so once the elevator to her floor opens, she immediately hurries out only to be followed the guy! AACCCKKKK. SOMEBODY HELP URI JIN YI. She runs over to Soo Kyung’s apartment, but no one’s there (okay, no seriously, at this point, I’m freaking out). She tries to call Dae Young, but gets interrupted with another incoming phone call. But then the man behind her realizes that the person he’s trying to reach is right in front of him so unveils himself as a man from the parcel service company (the guy is played by Big Star’s Feel Dog). The reason as to why he was dressed up all weirdly like that was because he had a cold. LOLOL. Jin Yi enters her apartment to get the item that the guy needs to deliver while the man stands outside waiting while dying coughing. She invites him inside her apartment since it’s cold, but in his Busan dialect, he replies, “It’s alright. There is no need to.” Of course, Jin Yi has never heard of the Busan accent anymore so she thinks he said, “Man da ko” (LOL). The man ends up clarifiying the situation by speaking in the Seoul dialect. It’s her turn to confuse him as she states that he’s the ‘Jjang Jjang Man’ (which is a phrase she often uses on somebody that she is really amazed by), but the man has never heard of that before so she has to clarify to him what she meant by ‘Jjang Jjang Man.’ Ohhh Jin Yi, you are one hilarious girl. (Right when he leaves, she calls him a funny person. Ahhh, so cute!). At the attorney office, Lawyer Kim can’t help stop gushing over Soo Kyung who’s busy working at her desk. They are all reminded to go home since it’s already time to leave work, but then a conversation between the co-workers drags on for a few more minutes (it’s not important). Soo Kyung coincidentally meets Kyung Mi and her family at the grocery store (including her two adorable sons!). They talk for a few minutes then Kyung Mi has her two sons do a proper greeting to Soo Kyung so in the grocery store that is populated with many people, her two sons gets down their knees and bows to Kyung Mi. Haha, too funny. I love how the sons aren’t even embarassed and just goes about bowing like it’s nothing, but Soo Kyung and Gyu-sik is for them. Soo Kyung decides to meet up with Jin Yi and Dae Young for dinner, but only Jin Yi can join since Dae Young has an appointment with a client. After eating, Jin Yi gifts Soo Kyung with an outfit that she made for Barassi to which Soo Kyung reallllyyyy likes. Just before they’re about to leave, Soo Kyung takes a picture of the empty dishes after being inspired by the person managing the food blog she visits often since he also posts pictures of empty meal dishes after he finishes eating. Jin Yi reveals that Dae Young also does the same thing so she shows Soo Kyung Dae Young’s blog which happens to be the same exact blog that Soo Kyung goes on: the ShikSha blog (I KNEW IT!). Back at his house, Lawyer Kim is coming up with ways to spend time with Soo Kyung over the Holiday break, since she told him she was gonna be home the whole break. That’s when his nephew comes up to him and asks him how to get taller. But since Lawyer Kim can’t offer any advices (his initial response was: I don’t know! I just grew up tall! ), his nephew asks Siri how to grow taller. (This is so funny, because I’m currently right now trying to find ways to grow as well since I’m so short and I’m tired of people making fun of me. Lol). Lawyer Kim is amazed that such a thing exists so after finding out about how Siri works a little more, he eventually uses it to find ways to woo a girl (which he will eventually use on Soo Kyung. Keke. I would like to see how this works out). It’s the Lunar New Years so everyone is busy celebrating the Holiday in their own ways. Soo Kyung is cooking some delicious food by herself, Dae Young went to go visit his parents, while Jin Yi is talking on the phone with her mom. After finishing her phone conversation with her mom, the door bell to Jin Yi’s apartment rings so Jin Yi goes to open the door. 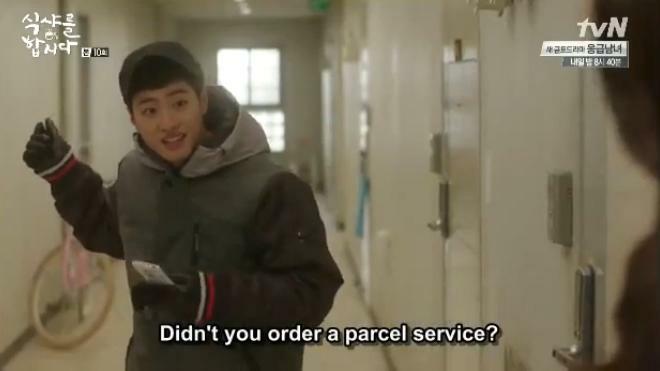 She finds the same man earlier from the parcel service there, desperate to find his gloves he believes he left in Jin Yi’s apartment. She eventually finds it and hands it back to him, but along with the gloves, she gives him a cup of tea to warm his voice up and make him feel better (since he’s still coughing like crazy). Soo Kyung is at a restaurant spending her Lunar New Years by herself when she sees Dae Young across the street from her. She runs out to meet up with him and acknowledges him as the ‘ShikSha blogger’ of the ShikSha blog that she’s a big fan of. They decide to join each other in for dinner since Soo Kyung’s really curious about the blogger of ShikSha who she can’t stop spazzing over. Unlike the many last times where Soo Kyung was reluctant to enter Dae Young’s car, this time, she runs to enter his car first. Haha. Lawyer Kim is on the elevator rehearsing the speech he’s going to say to Soo Kyung as he prepares to join her on the holiday. But he discovers that Soo Kyung isn’t home as evident when Barassi starts barking loudly at the sound of the door bell and there is no answer from Soo Kyung herself. Soo Kyung and Dae Young eat at a restaurant owned by a Grandma Dae Young is close to since he visits her restaurant often, even during the holidays. Soo Kyung complains that Dae Young isn’t talking like the ShikSha blogger and asks him if he can act like Mr. ShikSha instead of Goo Dae Young (such a big request!). 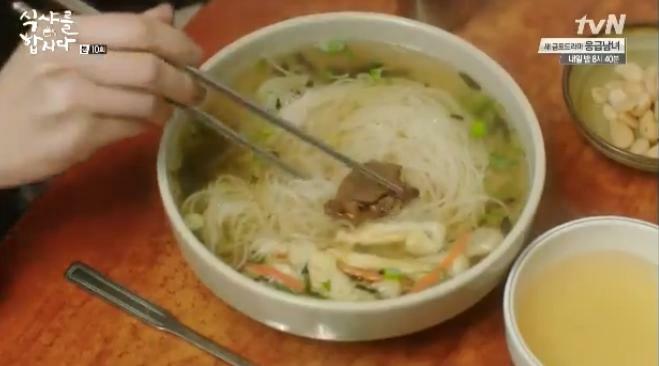 Dae Young is irritated by Soo Kyung’s constant spazzing about ShikSha, but then is willing to talk about why his blog is named ShikSha and not ShikSa (meal)…AFTER they eat the noodles which happens to arrive just in time. Soo Kyung doesn’t even stare at her food, because she’s busy watching Dae Young mix his! She wants him to comment about his food like usual now that she’s aware he’s Mr. ShikSha, but Dae Young is unable to since he’s feeling forced. He just tells her to eat so they eat the noodles. Meanwhile, back at Soo Kyung’s apartment, we see Lawyer Kim waiting inside of his parked car outside of the apartments. He chuckles and prepares to exit his car when he thinks he saw Soo Kyung, but when he finds out that it’s not, he’s left disappointed and sad. Dae Young and Soo Kyung are just about done eating when Soo Kyung generously gives the last piece of meat for Dae Young to eat since he’s Mr. ShikSha, but Dae Young refuses to eat it and feeds Soo Kyung the meat instead, which totally surprises Soo Kyung. She can barely move or think while Dae Young’s all busy taking pictures of their empty bowls and dishes. HAHA. 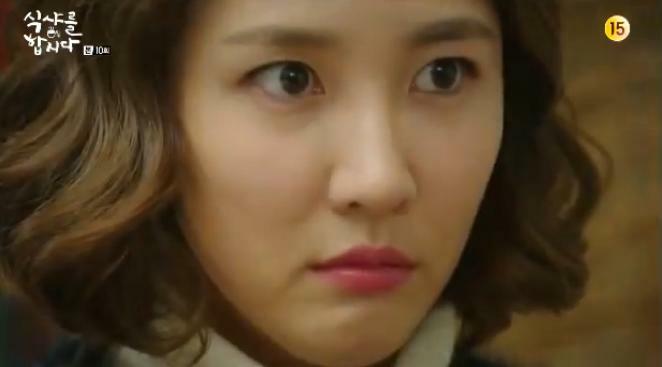 Unexpectedly, Soo Kyung starts to get hiccups which confuses Dae Young, because she usually doesn’t. She can only stare at Mr. ShikSha while breathing and panting loudly in anxiety and nervousness. Uh-oh, what could this mean?! (internal screams).